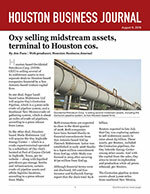 Oxy selling midstream assets, terminal to Houston cos.
Houston-based Occidental Petroleum Corp. (NYSE: OXY) is selling several of its midstream assets in two separate deals to Houston-based companies financed by a San Antonio-based venture capital firm. 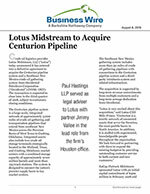 Crude oil logistics provider Lotus Midstream, LLC (“Lotus”) today announced it has entered into a definitive agreement to acquire the Centurion pipeline system and a Southeast New Mexico crude oil gathering system from Occidental Petroleum Corporation (“Occidental”) (NYSE: OXY). The transactionis expected to close later in the third quarter of 2018, subject to customary closing conditions. 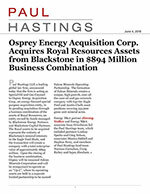 Paul Hastings LLP is acting as Special Oil and Gas Counsel to Osprey Energy Acquisition Corp., an energy-focused special purpose acquisition entity, in its pending acquisition through a business combination of the assets of Royal Resources, an entity owned by funds managed by Blackstone Energy Partners and Blackstone Capital Partners. Great Salt Plains Midstream Holdings, LLC (“GSPM”) recently closed on its acquisition of Thunderbird Midstream LLC. Both firms have headquarters in Oklahoma City. 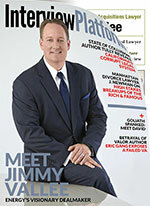 Jimmy Vallee talks about his new book Giant Shifts on the radio show The Price of Business. 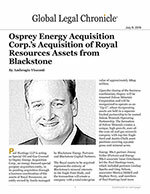 Investors OK with risk should look at master limited partnerships. 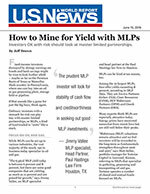 Fixed-income investors dismayed by skimpy earnings on bonds and bank savings might be wise to look further afield – maybe as far as the Permian Basin of Texas or Marcellus Shale country in Pennsylvania, where one can buy into an oil or gas processing plant, storage field or pipeline. If that sounds like a game for just the big boys, think again. Staff: The title of your book, Giant Shifts suggests we’re headed for big energy-driven changes. What do you see for the oil and gas industry in the next decade? 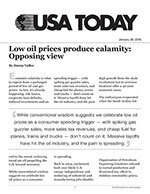 Economic calamity is what to expect from a prolonged period of low oil and gas prices. In fact, it’s already happening. Job losses, corporate loan defaults, reduced investments and an end to the recent reshoring trend are all propelling the U.S. toward recession.